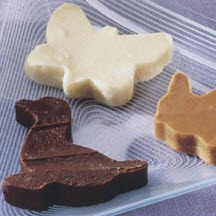 This fudge never fails to set up and is perfect for making fun cut-out shapes to suit the occasion. Recipe includes flavor variations. Line 13 x 9 x 2-inch pan with foil, extending foil over edges of pan. Place chocolate chips, sweetened condensed milk and salt in large microwave-safe bowl. Microwave at HIGH (100%) 1 minute; stir. Microwave an additional 15 to 30 seconds or just until chips are melted and mixture is smooth when stirred. Stir in walnuts, if desired, and vanilla. Immediately spread evenly in prepared pan. Cover; refrigerate 2 hours or until firm. Use foil to lift fudge out of pan; place on cutting board. Peel off foil. With cookie cutters, cut into favorite shapes. Store tightly covered in cool, dry place. Makes about 2 pounds fudge. Conventional Directions: Melt chips with sweetened condensed milk and salt in heavy saucepan over lowest heat. Remove from heat; stir in walnuts, if desired and vanilla. Spread evenly into prepared pan. Butterscotch Fudge: Substitute 3 cups (almost two 11-ounce packages) HERSHEY'S Butterscotch Chips. Peanut Butter Fudge: Substitute 2 1/2 cups (about 1 1/2 10-ounce packages) REESE'S Peanut Butter Chips. White Fudge: Substitute 3 cups (1 1/2 12-ounce packages) HERSHEY'S Premier White Chips.